Objective: The main objective of the study is to screen the quality markers (Q-markers) for relieving oxidative stress damage and against chronic cerebral ischemia in Shunaoxin pills (SNX). 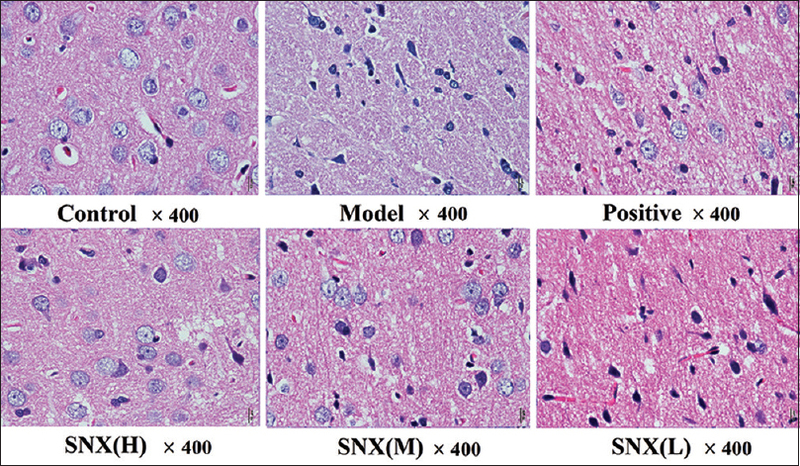 Methods: The benefit effect of SNX was evaluated by a rat chronic cerebral ischemia model. The main ingredients of SNX were identified by ultra-performance liquid chromatography-quadrupole time-of-flight, whereas its core targets and pathways around antioxidative stress were predicted by PharmMapper and kyoto encyclopedia of genes and genomes (KEGG) analysis. 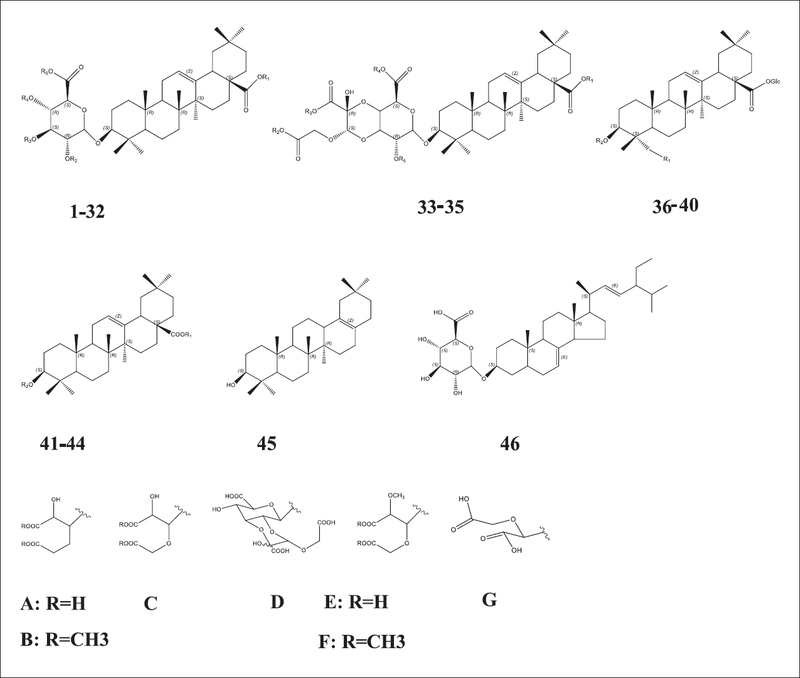 Moreover, the antioxidants were screened by high-performance liquid chromatography with postcolumn derivatization system and then representative ingredients were verified by cell experiments. Results: SNX could increase expression of catalase and superoxide dismutase (SOD) as well as antagonize oxidative damage in the brain. The effects may be related to three types of antioxidant pathways, including nitrogen metabolism, arachidonic acid metabolism, and the cyclic guanosine monophosphate-dependent protein kinase (cGMP-PKG) signaling pathway by multiple active components regulate targets. Among them, ferulic acid and ligustilide were shown the key scavenging ability for reactive oxygen free radicals and significantly increased the contents of nitric oxide (NO), NO synthase, and SOD as well as decreased malonaldehyde. Conclusion: The oxidation resistances of biological and chemical processes in SNX to protect against cerebral oxidative stress injury were preliminary revealed by an integrated network pharmacology and antioxidant activity-guided screen system. Ferulic acid and ligustilide played a major antioxidant role that could be used as Q-markers to control the quality of SNX. Objective: The aim of this study is to explore the characteristic manifestations and contraindications of Xiaochaihu decoction (XD [It also stands for all the seven herbs in XD]) syndrome and to clarify the principle of using XD. Methods: By searching on the Encyclopedia of Traditional Chinese Medicine, 254 cases whose symptoms were relieved by XD and 48 cases who misused XD in ancient time were selected. Moreover, they are divided into two groups. Microsoft Excel 2016 was used as a storage tool. These two groups of cases were all treated with XD because of their similar manifestations, but therapeutic efficacies are reverse. The manifestations mislead doctors should be selected out to clarify the indications of using XD. Thus, the professional data mining software RapidMiner was used as a platform to do the frequent statistic and to create association rules between manifestations and herbs of both groups, respectively. After comparing the results of two groups, we can make a conclusion. Results: The characteristics of XD syndrome are alternative chills and fever, hypochondriac pain, and inflammatory swelling and pain (ear or breast). When any of these manifestations occur, XD can be used. Wiry pulse paired with alternative chills and fever, headache, thirst, or hypochondriac pain is also regarded as the indications of using XD. XD should not treat for fever paired with other manifestations, such as headache, delirium, or aversion to cold. In addition, the manifestations with high concurrence frequency do not mean the high correlation. Moreover, only according to the frequency, statistics cannot make correct conclusions. Conclusions: (1) XD is more fit for the excess syndrome such as excess fire in the liver or gallbladder meridians. (2) The medical records in which the XD is misused are also worth analyzing. (3) Association rules cannot be substituted with frequency statistics. Objective: To compare the efficacy of traditional Chinese medicine (TCM) based on Zheng differentiation with angiotensin receptor blocker/angiotensin-converting enzyme inhibitor (ARB/ACEI) in treating diabetic kidney disease (DKD) from the aspects of decreasing urinary microalbumin, declining 24-h urinary protein, reducing endpoint events, and renal function protection. Methods: The Chinese Biomedical Literature Database (CBM), the Chinese Academy of Sciences database (CNKI), the VIP Chinese journal database, Wanfang DATA, Medline database, Cochrane library, excerpt medical database (Embase), and Web of science were used for literature searching. The reviewer manager 5.3 software was utilized to analyze the data. Results: Twenty-four studies including 1956 participants were involved in this review. Results showed that TCM had a better effect (mean difference [MD], −23.20, 95% confidence interval [CI], −30.60 to −15.79, P < 0.00001) than ARB/ACEI on lowering urinary albumin excretion rate (UAER) and urine albumin-to-creatinine ratio (MD −4.56 mg/mmol, 95% CI, −5.76 to −3.36, P < 0.00001). Moreover, the advantage of decreasing UAER was greater as the follow-up period become longer (P = 0.04). 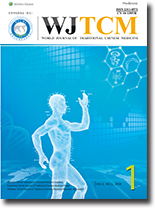 TCM also had a better effect in 24-h urinal protein, decreasing 0.36 g/24 h (95% CI, −0.45 to −0.27, P < 0.00001) more than the control in shorter follow-up period (ranged from 12 to 24 weeks) subgroup but only 0.08 g/24 h (95% CI, −0.13 to −0.03, P = 0.0006) in the longer follow-up period (>24 weeks) subgroup. TCM worked as well as ACEI/ARB in reducing endpoint events (relative risk, 0.67, 95% CI, 0.20–2.224, P = 0.51) and decreasing urinary albumin concentration (UAC) (MD, −16.50, 95% CI, −46.28–13.28, P = 0.28). As for protecting renal function, TCM had an equal effect to AECI/ARB in improving creatinine clearance ratio (MD, −3.30, 95% CI, −6.66–0.03, P = 0.05) or estimated glomerular filtration rate (MD, 1.00, 95% CI, −0.59–2.58, P = 0.22). However, TCM had a better effect in releasing the glomerular hyperfiltration state (MD, −9.64, 95% CI, −14.45 to −4.84, P < 0.0001). Conclusions: TCM based on Zheng differentiation can work as well as ACEI/ARB in treating DKD and even better in decreasing urinary microalbumin and releasing glomerular hyperfiltration. It is a good alternative treatment of DKD. Objective: To investigate the effect of Yinqi ointment on wound morphology and growth factor in treating diabetic foot ulcer (DFU). Methods: From December 2016 to December 2017, 92 cases of DFU with deficiency of both Qi and Yin syndrome were randomly divided into treatment group and control group (44 cases in each group). The treatment group was treated with Yinqi ointment, while the control group was treated with mupirocin ointment. After 4 weeks of treatment, the ulcer healing effect, ulcer area, granulation tissue, epithelial tissue coverage, pain score, and dynamic analysis of vascular endothelial growth factor (VEGF), epidermis growth factor (EGF), and basic fibroblast growth factor (bFGF) in local granulation tissue were statistically analyzed before and after treatment in both groups. Results: The total effective rate was 88.37% in the treatment group and 74.42% in the control group. The wound reduction rate, epithelial tissue coverage rate, granulation tissue growth rate, and local pain relief rate in the treatment group were significantly superior to those in the control group (P < 0.05). 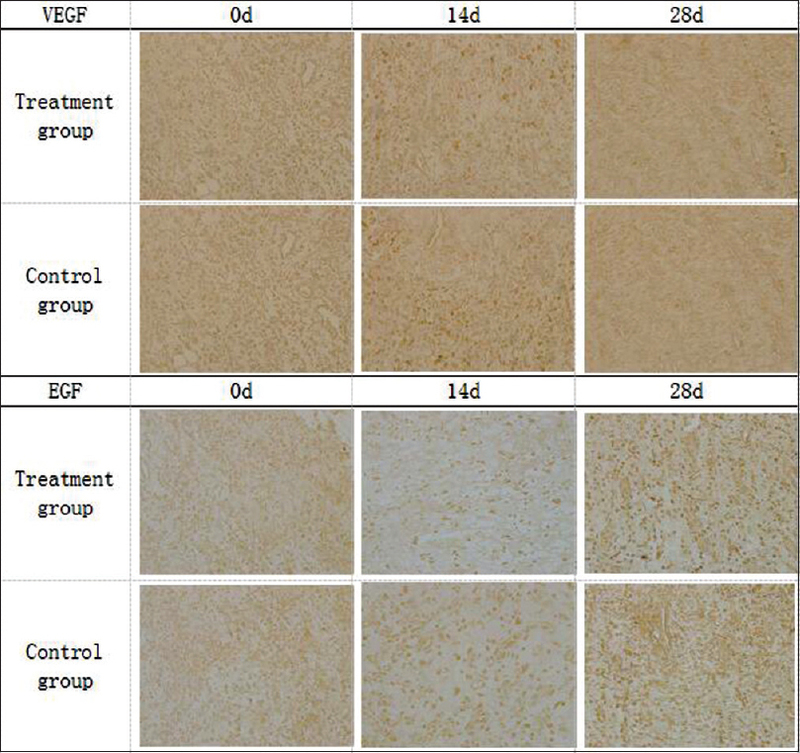 Through the local granulation detection, the treatment group and the control group have increased VEGF, EGF, and bFGF, but the treatment group increased the role of growth factor than the control group. Conclusion: Yinqi ointment can promote the healing of DFU, and its mechanism may be related to the increase of the content of growth factor in granulation tissue. Objective: To explore the effects of Peiyuan Tongnao (PYTN) Capsule on working memory, the content of glutamic acid, and the expression of NMDA receptor 2B (NR2B) in rats with cerebral ischemia. Materials and Methods: 52 Sprague-Dawley rats were randomly divided into sham group, model group, nimodipine group, and PYTN group. The bilateral common carotid artery occlusion (BCAO) was performed to establish rat model with cerebral ischemia in the model, nimodipine, and PYTN groups. Gastric lavage with some drug based on body weight conversion was performed daily for 4 weeks in the nimodipine and PYTN groups. The working memory of the rats was tested by Morris water maze. The expression of Nissl body in hippocampus tissue was observed by Nissl staining. The determination of Glu content in hippocampus was detected by high-performance liquid chromatography. The expression level of NR2B in hippocampus area was determined using Western blot. Results: Morris water maze test on working memory escape latency. In the model group, day 1 versus day 4, there was a statistical difference (P < 0.05). 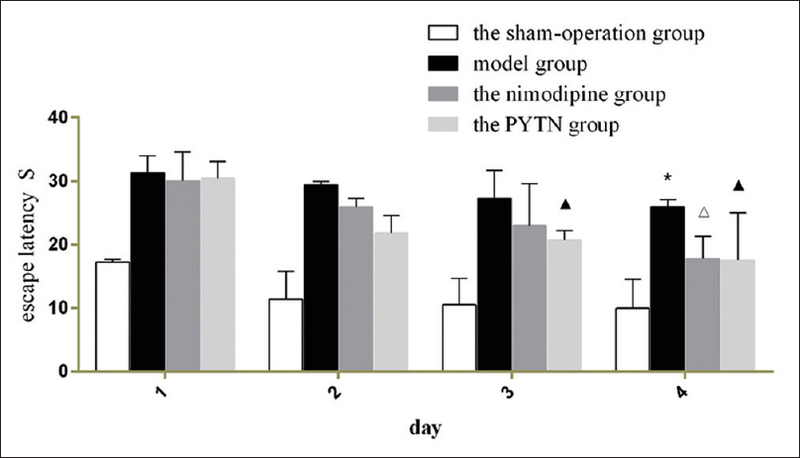 In the nimodipine group, day 1 vs. day 4 displayed a statistical difference (P < 0.05). In the PYTN group, day 1 versus day 3 and day 1 versus day 4 were in significant differences (P < 0.05). The Glu content in hippocampus of the sham group was significantly different from that of model group (P < 0.05). The Glu content in the PYTN group was significantly different from that of the model group (P < 0.05). With regard to the expression of NMDA 2B in hippocampus between the sham group and the model, nimodipine, and PYTN groups, all were displayed statistical significance (P < 0.01). As the same, the expression of NMDA 2B in the model group was significant from that of the nimodipine group (P < 0.05) and PYTN group (P < 0.01). Conclusion: PYTN capsule was beneficial for improving working memory and protect neural cells in rats of cerebral ischemia, which may be associated with upregulation of the expression of Glu and NMDAR2B in hippocampus. Objectives: The objective of the study is to observe the effects of ginsenoside Rb1 on indexes of body weight, body composition, blood lipid, skeletal muscle endurance, and insulin sensitivity in obese mice, probe into its pharmacological action, and further explore its effects on adenosine monophosphate-activated protein kinase (AMPK) signaling pathway in skeletal muscle. Materials and Methods: Eight-week-old C57BL/6J mice were fed with high-fat diet for 12 weeks to establish obese mouse model. 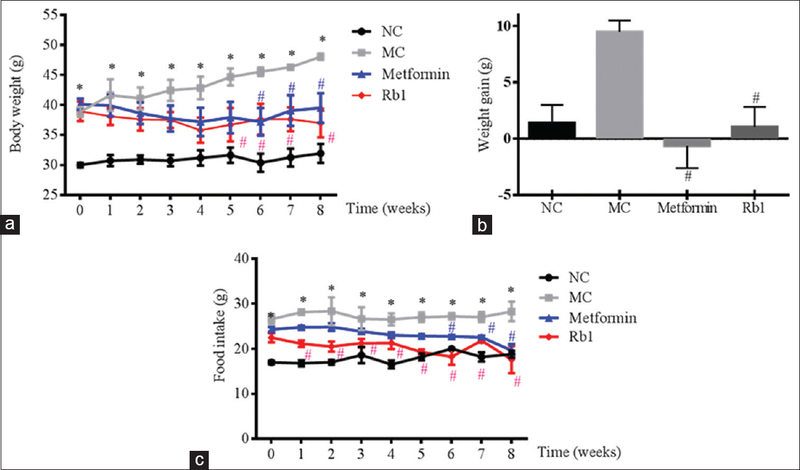 The model-establishment obese mice were randomly divided into three groups including model control group, metformin group, and ginsenoside Rb1 group. In the normal control group, normal diet was administered. The intervention period was 8 weeks. Body weight and food intake of the mice were measured regularly every week. The treadmill test was performed at weeks 3 and 7, and the oral glucose tolerance test was carried out at weeks 4 and 8. Body composition of the mice was detected by applying NMR Animal Body Composition Analyzer at week 8. Four parameters of blood lipids and free fatty acid (FFA) levels were detected. The mRNA expression of AMPKα and proliferator-activated receptor gamma coactivator-1α (PGC-1α) in skeletal muscle was examined by real-time fluorescence quantitative polymerase chain reaction, and the influence of ginsenoside Rb1 on protein expression of AMPKα, p-AMPKα, and PGC-1α was observed by western blotting. Results: The body weight (since the 5th week of drug administration) and food intake of the mice in the ginsenoside Rb1 group were significantly lower than those in the model control group (P < 0.05) in a time-dependent manner. Ginsenoside Rb1 could significantly reduce the levels of triglyceride and low-density lipoprotein cholesterol, while increase the high-density lipoprotein cholesterol level (P < 0.05). In addition, ginsenoside Rb1 could reduce the serum FFA level (P < 0.05). After the administration of ginsenoside Rb1 for 8 weeks, the body fat mass of obese mice decreased and the lean mass increased (P < 0.05). The skeletal muscle endurance and the oral glucose tolerance of the obese mice improved using ginsenoside Rb1. At the molecular level, ginsenoside Rb1 could up-regulate the mRNA and protein expression of AMPKα in skeletal muscle, and increase the content of p-AMPK protein significantly (P < 0.01). At the same time, the mRNA and protein level of PGC-1α was also un-regulated, correspondingly (P < 0.01). Conclusion: Ginsenoside Rb1 exerts effects on reducing body weight, decreasing blood lipid levels, enhancing the skeletal muscle endurance, and increasing the insulin sensitivity in obese mice by activating the related proteins in AMPK signaling pathway in skeletal muscle. Radix achyranthis bidentatae (RAB), a member of the Amaranthaceae family, has been widely used in Traditional Chinese Medicine for 1000s of years. Increasing interest in RAB-derived medicinal has led to the discovery of additional triterpenoid saponins, phytoecdysones, polysaccharides, and many other compounds, as well as investigations into their pharmacology. A large number of pharmacological studies have shown RAB and its active components possess a range of pharmacological activities, including anti-tumor, anti-fertility, anti-senile, and anti-inflammatory effects. This review is an up-to-date summary and synthesis of the uses of RAB from phytochemical and pharmacological perspectives. Objective: The objective of this study is to evaluate the efficacy and safety of the clearing the lung and dissipating phlegm method in the treatment of acute exacerbation of chronic obstructive pulmonary disease (COPD) and to provide evidence for the treatment of the disease. Materials and Methods: Literature was searched from the United States National Library of Medicine (PubMed), Embase, Cochrane Library, China National Knowledge Infrastructure, Wanfang Database (Wanfang), and the Full-Text Database of Chinese Scientific and Technical Periodicals (VIP). A comprehensive collection was made of randomized controlled trials (RCTs) before June 2018, in which the treatment groups used either the clearing the lung and dissipating phlegm formulas only or combined it with routine Western medicine therapy, and the control group adopted routine Western medicine therapy only for the acute exacerbation of COPD. The Cochrane risk of bias method was used to evaluate the quality of the literature. The data were analyzed and retrieved independently by two reviewers before meta-analysis was carried out with RevMan 5.3 software to evaluate the primary outcome measures, including the total clinical effective rate, and the secondary outcome measures such as the pulmonary function (forced vital capacity [FVC], forced expiratory volume in the 1 s [FEV1], percentage of FEV1 [FEV1%], and FEV1/FVC) and blood gases (PaO2 and PaCo2). Results: A total of 13 RCTs involving 990 patients (496 in the treatment group and 494 in the control group) were included in this study. 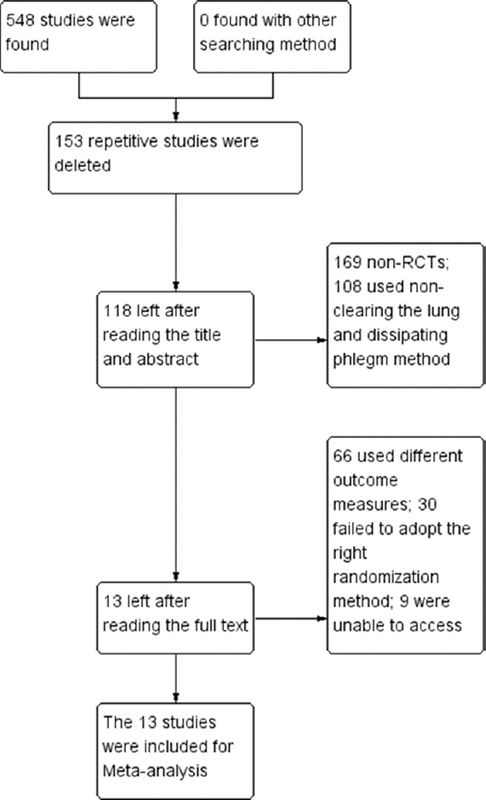 Meta-analysis revealed significant difference in the efficacy of the group that adopted solely the routine Western medicine method and the group that combined the Western medicine with the clearing the lung and dissipating phlegm method. Outcome measures including the pulmonary function (FVC, FEV1, FEV1%, and FEV1/FVC) and the blood gases (PaO2 and PaCo2) were significantly improved as compared to the control group (P < 0.00001). 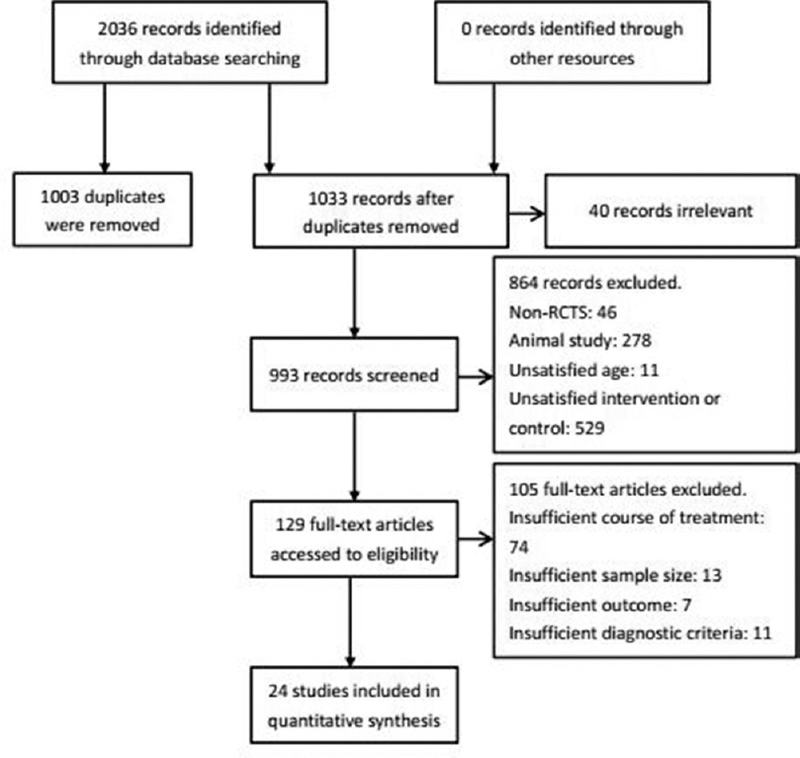 However, adverse effects in the treatment group using combined traditional Chinese medicine were not reported due to the short observation time of the study. Conclusion: The clearing the lung and dissipating phlegm method can improve the efficacy in the treatment of acute exacerbation of COPD, the outcome measures of the pulmonary function and the blood gases, as well as the life quality of the patients. However, due to the fact that the existing studies are generally of poor quality in which randomization and its implementation were not properly carried out, more high-quality RCTs are necessary to confirm the findings of this study.